Uniden MHS135DSC | Our complete unbiased review of the Uniden MHS135DSC handheld VHF radio and more on marine electronics. The Uniden MHS135DSC is a floating marine handheld VHF radio with a built-in GPS, a 6-watt maximum power output, and front panel SOS strobe light. This marine handheld is this company’s first entry into this unique device combo market. In addition to GPS capability this radio has all the standard operational features you’d expect in a top shelf handheld radio as well as a temperature sensor and GPS based compass. The radio body stands approximately 6-inches tall, is about 2.5-inches wide, and 1.5-inches deep—not counting the removable belt clip attachment. Overall height including the antenna is just under 11-inches. On my scale, with the 1040 mAH lithium-ion battery pack installed, the MHS135 weighed in at 11.3 ounces. That is about the middle of the pack weight wise when compared to others similarly equipped. The MHS135 handheld marine VHF radio package ships with the radio, rechargeable lithium-ion battery, charger tray, AC and DC charger power cords, belt clip, wrist strap, AAA battery tray, owner’s manual, and a detachable hand microphone/speaker. This is the first marine handheld I have ever tested to some standard with an external hand mic. The hand mic has a clip that you could attach to a shirt collar or pocket while keeping the radio itself mounted on your belt. Quite convenient. The drop-in AC charger cradle will hold the radio with the battery installed and complete a charge cycle in a maximum of about 7 hours depending on the charge level of the battery. This charger shows an orange light to indicate charge in progress and green light to show a fully charged battery. All controls on this radio are pushbutton, with 10 on the front panel and one on each side. The push-to-talk switch is dual action with a power boost option on the lower half of the switch. On the right side you will find a DSC emergency calling switch protected by a red weather cover. The external speaker/microphone jack sits atop the radio case. The antenna on this unit is removable and with the proper fitting could be connected to the fixed mount on a vessel to provide backup VHF capabilities. One button control is available to select any one of three levels of transmitter output power, turn the front panel mounted SOS high-intensity LED light on or off, channel up or down, switch to weather channels, quick select channel 16 or 9, view to a GPS screen, call up the menu and control several scan features. Scan modes include weather alert watch, DSC watch, dual watch, and triple or tri-watch. In the tri-watch mode channels 16 and 9 will be scanned with the third being user selected. Dual watch monitors 16 and a working channel. A single press of the MEM key turns on memory scanning. All channels entered into memory will be scanned. This mode can be combined with other scan modes. The Uniden MHS135DSC can use all Canadian, International, and US marine VHF channels, and NOAA weather channels. The Uniden MHS135 incorporates a built-in GPS receiver and digital selective calling capabilities. To initiate the use of DSC functions you will need to register for, obtain, and then enter an MMSI number. GPS functionality is straightforward and easy to use. You can navigate to a manually entered position of select a favorite previously saved position. When navigating to a location with the Uniden MHS135DSC a rudimentary compass rose with show graphic presentation of the point in relation to the radio as well as numeric course over ground, bearing to the waypoint, and distance remaining. The waypoint name is displayed on the bottom of the screen while the selected VHF channel is shown on the right side. After you have programmed an MMSI number into this radio it will be capable of making a DSC distress call simply by lifting the red side cover and pressing the red distress pushbutton. The radio will also make an individual, all ships, and group calls. Position request and report calls capability exist as well. The Uniden MHS135 features a front panel mounted SOS strobe light which can be selected to flash SOS or steady on. It also features a built-in water temperature sensor. This radio is waterproof and carries a JIS8 rating, meaning that it can be submerged to a depth of 1.5 meters for 30 minutes without sustaining any damage. This Uniden marine handheld VHF radio carries a 3-year warranty. I tested the Uniden MHS135DSC using the supplied 1040 mAH lithium-ion battery pack. An alkaline battery tray is also supplied as well and holds 4 AAA batteries. When the alkaline battery pack is in place transmitter power output is limited to 2.5-watts. I measured 90 dBA during the audio output test and rated the audio performance good. The MHS135 features a full dot matrix 1.75-inch (measured on the diagonal) display screen with 128 by 64 pixels of resolution. I rated the screen excellent and find it quite large for a marine handheld VHF radio. Pressing any key will turn on red backlighting for the screen and pushbuttons while screen contrast is adjustable via the system menu. Channel group, transmitter power setting, and a GPS status icon are displayed in the top left portion of the screen. Bottom row information scrolls channel comments as well as reporting when the radio is transmitting. The selected transmitter power output level is shown onscreen with and H(6-watts), MID(2.5-watts), or LOW(1-watt). A large battery level indicator on the far right side of the screen shows a filled battery shaped icon when full. As the battery charge drops the battery icon empties. The Uniden MHS135DSC marine handheld VHF/GPS combo managed to last for 7 hours in our battery life test. An aural alarm and empty battery icon will give you warning that the battery is reaching a point of near depletion. To test the unit I transmitted a signal for 3 minutes every hour and listened to a weather channel broadcast at a moderate volume level for 5 minutes every hour. This is the industry standard for duty per hour on a handheld device. It passed both the drop and submersion tests with no glitches. 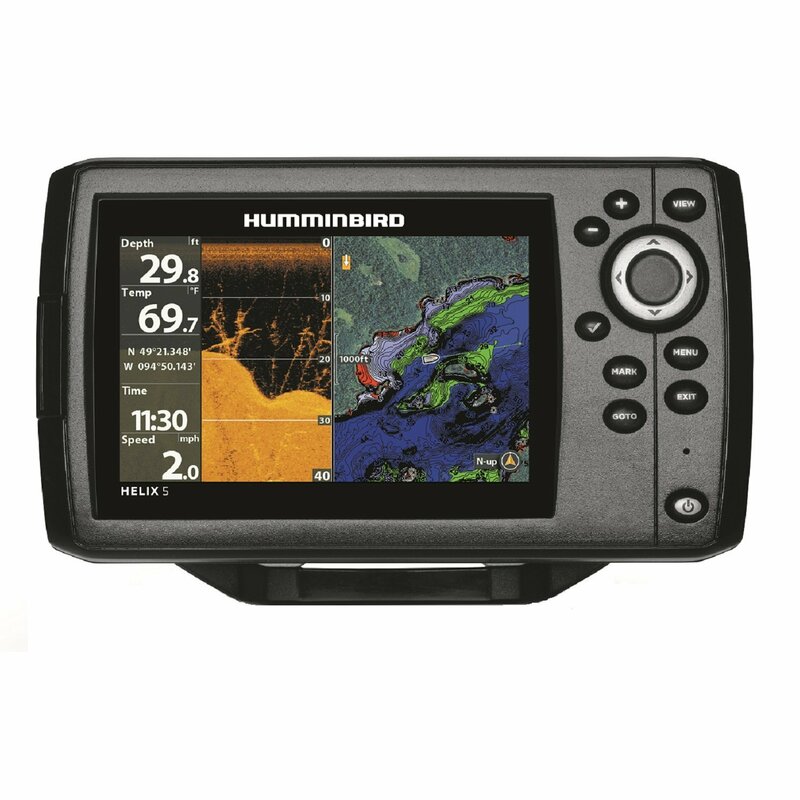 The Uniden MHS135DSC floats, has an internal GPS, can navigate, make DSC calls, and display an SOS with its built-in strobe light. Lots of functionality in a compact package should make this radio a hot seller. I am rating it a buy. Shop for this GPS-equipped Uniden floating handheld radio here.